When it comes to converting visitors to potentials buyers, Landing page plays an important role. Therefore, it is essential to have a great looking landing page that encourages visitors to convert well. A good landing page can generate up to 8% more leads than an average landing page. In this post, we will share come of the most important elements and characteristics of a high converting landing page and best practices. Before we talk about what a great landing page looks like we need to understand what it is and why we use landing pages? Landing Page is simply a webpage that a visitor lands on after performing an action. That visitor might land on the page through organic search, paid ads, referred from another website, or can come from any other page on the website. Do not confuse home page with the landing page as both pages have a different purpose. The home page is a hub for all the services or types of services/products or what that website has to offer and users have to decide on what they want to get. Landing page, however, is more focused towards a single service offering or has one goal only. Usually landing pages offer a free trial, a subscription, downloadable link, or a product that a user can order right away. And the whole page revolves around that specific goal. That is “Getting Users to Convert”. The Headline is the most important element of a perfect landing page. Wrap it around <h1> tags. Use to-the-point wordings in your heading that clearly explain what the page is about. Clear and interesting highlighted text can do a lot more than simple paragraphs filled with information. It’s better to grab the attention of the visitor with bold highlighted figures that clarify the user’s intentions and actions right away. Once the visitors land on your page, you only have 3 – 7 seconds to grab their attention to the offering. Headings and subheadings are great to achieve this goal. The Grammar and words you use on your landing page and the overall website need to be flawless and the tone of voice needs to be constant throughout. The tone of voice you use has a great impact on the overall branding of your business. Bad Grammar and spelling mistakes are to be avoided anyway as they have a huge negative impact on your brand credibility. Call to actions are important for any page that focuses on visitors to take action. However, Call to actions on Landing Pages and Home pages both serve a different purpose. Home page might have multiple call-to-actions but for a purposeful landing page, there should only be one clear CTA that guides the users about what they have to do next. Having multiple buttons and links on a landing page can distract the visitor and decrease the chances of conversion. Having only one CTA is a clear indicator of what next the user has to do. It should never use direct words like “Submit”. Instead, Use natural language phrases that explain what the user has to do and what will happen. For example: “Get This Guide”, “Sign Me Up!”, “Start a Free Trial”. 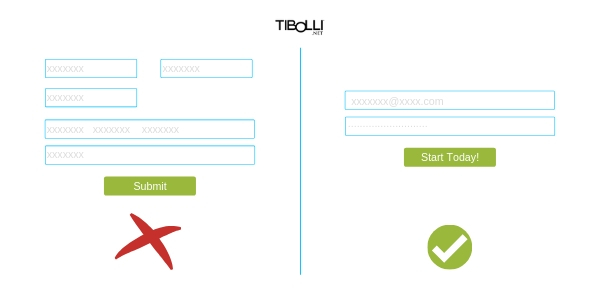 Some landing pages go crazy with adding multiple form fields that a user has to fill to get access. This discourages the visitors to take any further actions. 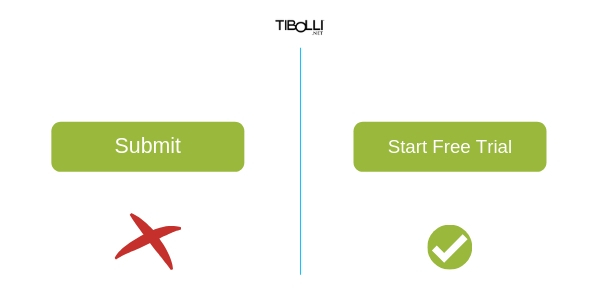 If you are planning to add the form directly in the landing page, then make sure to remove any unnecessary field and only keep the fields that are actually required by your marketing team. It’s best to just ask for a Name and Email in the first step to make the process quick and easy. Avoid any information that a user may resist to provide or is not needed for your business followups. There are 68% more chances of a visitor taking action if he finds the landing page trusted. And the best way to do that is to add reviews and testimonials. These are proven to grab attention and make the decision-making process a lot easier. Display any reviews, ratings or things that can prove your authenticity to a new visitor. It may include displaying your partners, happy customers or achievements. As mentioned earlier, landing pages should only serve one purpose and that is to convert the visitor into a customer or a lead. So any link leading to a different page or website should be avoided in order to maintain the visitor’s attention on the landing page. Above the fold means you should display the useful information to the user on the screen up front. As there are less than 30% chances a user will scroll down for more information. 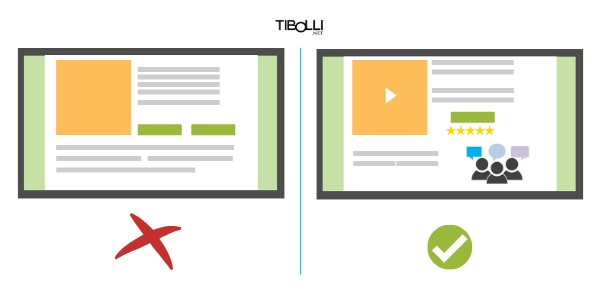 It’s better to have only the most relevant information above the fold and avoid any clutter. Tip: Shortening the Header Section or completely removing the header from the landing page will give you more room. To play around with stuff. We can present a number of websites that won’t look anything more than a backyard of your house where you dispose of all unnecessary things. While designing a landing page, it’s important to think like a customer. Before starting; ask yourself questions like, is it good? What if I apply this font? Will this color entice customers? Asking such questions will help you to have a better landing page. A page that will actually gain attention and customers will appreciate. It is not possible to make 1 landing page and assume that it has the highest conversion rate. You should create 3 to 4 layouts for your landing pages and perform A/B testing on them by keeping track on your visitor’s behavior and rearrange the content accordingly. Sometimes, having a mirror image of a page can also have a huge impact on the CTR. You might consider using a heatmap to track where your visitors spend most of their time and adjust according to increase the chances of conversion. What Kind of Colors Should Be Used for a Great Landing Page? Color psychology plays a vital role in a landing page as some colors provide a sense of action that we in general day to day life do not notice. This small color guide can help you deciding what colors you should be used for your business and are more suitable for your perfect landing pages. Yellow Color is Often used to grab attention. We all know the yellow color is the first one to be picked up by the yes as compared to any other color. The red color is used to portray panic and urgency to take action. Often used by businesses to display their limited time offers and sales. The blue color is often used by Finance firms and banks as it provides the feeling of trust according to human psychology. The green color is the easiest on the eyes and more suitable to business that involves entertainment, fun or money management. The orange color is known to be an attention grabber just like Yellow and is suitable for Call to Action buttons. Pink color attracts mostly female audience mainly young teens or women. Best suitable for feminine products or baby products. We don’t see black color being used on products quite often but it is mostly used by Luxury brands targeting a very specific audience. How to design a high converting landing page. 11 Things to keep in mind to make a perfect landing page with the highest conversion. Pretty component of content. I just stumbled upon your website and in accession capital to say that I acquire in fact loved account your weblog posts. Any way I’ll be subscribing in your augment or even I success you access persistently fast. Sure and thanks for the feedback.